Many times we refer to Philippine TRICARE beneficiaries as being treated as second class beneficiaries by the Defense Health Activity (DHA) and International SOS (ISOS). There are many reasons for this classification including multiple Philippine unique policies that are designed to cause beneficiaries to be denied access to care and denied payment for legitimate care from legitimate providers and all in the name of protecting the taxpayer from massive fraud; if one cares to believe the DHA hype. In addition ISOS tends to ignore beneficiary inquires claiming secrecy or just ignore you after saying they will get back to you. One set of data DHA has thrown around under the guise that it represents massive fraud is the total annual billed amounts in the Philippines claiming they represent fraud. In reality a single figure like that has no meaning without some reference point and in this case billed amounts have no meaning at all. What matters is what DHA paid for the care and paid with reference to another figure such as the population served. In other words the amount paid per person, or more properly the per capita cost, compared to some standard. DHA avoids this kind of information because it clearly shows how poor a job they and their contractor are doing in providing the benefit in the Philippines so opt for meaningless rhetoric. First it becomes obvious they know nothing about the beneficiary population as they claim the number remained constant from 1999 through 2009 at 11,000 beneficiaries. The DOD Actuary, the official DOD source of retiree populations, shows a real increase in population of 15.64% between 2001 and 2010 so we have to dismiss any comparisons they tried to make to billed amounts over time as their assumptions do not hold up to documented facts! Later we will take a look at these billed and actual expenditures on a per capita basis which will show how extreme and deliberately misleading most of their claims are. Billed amounts in the U.S. are typically two to five times the amount paid by insurance companies so throwing these figures around as proof of fraud is nothing more than a red herring designed to hide the real truth and perpetuate the myth of continued ongoing fraud. As you can see billed amounts have little relationship to what the insurance industry pays. 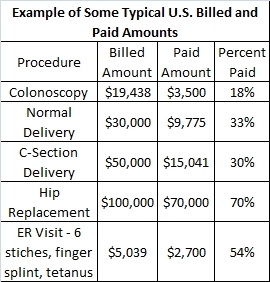 This information came from an article, The $2.7 Trillion Medical Bill. The possible exception is TRICARE’s CMAC in the Philippines which pays out up to 5 times the local rates for outpatient visits and which ISOS used, as what appears to be an incentive, to get local providers who were reluctant to get had again by TRICARE to sign up for the Demo; greed is always a good incentive. DHA used these tactics of meaningless data to implement poorly designed draconian measures that did little to curb fraud but did significant harm to beneficiaries, their access to care and ability to be reimbursed for legitimate care from legitimate providers in an attempt to convince Congress they are doing everything they can to reduce provider and beneficiary induced fraud in the Philippines. Don’t forget they also like to imply that the majority of beneficiaries in the Philippines are involved in fraud as well. Since the closure of HVC the fraud that continued came mostly from the fake hospitals and fake provider groups ISOS certified which allowed them to submit fraudulent claims and be paid. Only after the Defense Criminal Investigative Service (DCIS) and the U.S. Attorney’s Office, Western District of Wisconsin investigation of ISOS and their Certification process in 2011 did we finally see these fake providers that were reported to DHA for years start to disappear. See DODIG Report No. D-2011-107. Earlier we said throwing around billed amounts and in isolation was simply a red herring. And a valid method would be comparisons of per diem paid amounts compared to expected per diem paid amounts for the general population. This would indicate if beneficiaries are receiving adequate levels of care and/or if the amounts might contain excessive fraudulent payments compared to a norm. One way is a comparison of average expenditure per beneficiary across the TRICARE family or between TRICARE beneficiaries and the general U.S. population. While some variables may cause fluctuations in these comparisons that may not reflect differences in access to care one could be fairly confident that any variation outside ±10% would be sufficient proof that the variation is significant; lower meaning significant access to care issues and higher meaning fraud issues. Review the chart above. The per capita rates for the U.S. came from the World Bank. DHA says the cost of care in the Philippines is 57% of the cost of care in the U.S. except for pharmacy, lab and x-ray which they say cost 100% of the U.S. rates. We used the rate of 57% that represents a lower percentage than DHA says is the actual cost of care in the Philippines. Based on DHA’s own calculations, if individuals are receiving levels of care in the Philippines that are comparable to what would be received in the States the actual amount spent per person would be close to $4,554 for 2009. 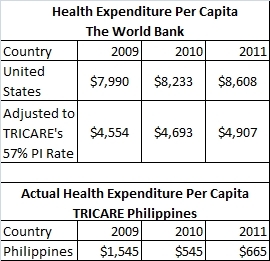 The actual TRICARE expenditures per capita are simple to calculate by taking the amount DHA claims was actually paid on Philippine claims and dividing it by the population the DOD Actuary indicates is in the Philippines. For example, above DHA stated they spent $17 million on care in the Philippines in 2009. When you divide $17 million by 11,000 you get $1,545. Compare that to what we would expect, $4,554 if we had adequate access to care. That amounts to 33.9% of what should be expected. Yet DHA tries to portray that $17 million expenditure as excessive and containing fraudulent expenditures. The comparisons for 2010 and 2011 show even worse access to care issues. We did a similar study using just TRICARE beneficiary paid amounts along with Medicare paid amounts against the 2010 Philippine paid amounts and found very similar results and this study was provided to DHA but as usual they were silent and admit to nothing. See, The Elimination of the TRICARE Medical Benefit for Military Retirees in the Philippines. The bottom line; DHA and ISOS have reduced access to care to the lowest levels of any TRICARE beneficiary population anywhere in the world and they are well aware of it and obviously don’t care. They continue to deny there are any issues in the Philippines beyond fraud and claim everyone, but a few malcontents, are happy with their benefit. Their Demo, that covers less than 2% of the Philippines, is a disaster as it offers extremely limited access to care with almost no choice of providers, which violates DHA’s Patient Bill of Rights. DHA claims the Demo will fully cover the vast majority of beneficiaries but they have no idea where beneficiaries reside so it is obvious that claim has no basis in reality either and if a beneficiary ever traveled in the Philippines they would lose their benefit. As our survey of Military Retirees in the Philippines showed the majority of beneficiaries pay for their own care because they know they are not medical coders and claims processors so can’t convert local claims and the per diem rates above clearly support this finding. DHA also knows these claims cannot be converted by local providers which was the cause of every provider in Angeles City dumping the Demo. DHA only got a few back after hiring coders and claims processors to do the claims for them in spite of serious conflicts of interest. But still they lie to beneficiaries by telling them to go to their providers who will gladly and correctly convert local bills into U.S. claims; something not even U.S. physicians can personally do. See DHA’s and ISOS’s official guidance to us claiming local providers are versed in U.S. medical coding and claim processing so they can assist in converting the very claims that the Demo providers failed to accomplish. These figures are not disputable by DHA. Use the figures above, The Elimination of the TRICARE Medical Benefit for Military Retirees in the Philippines study and the recent survey of Military Retirees in the Philippines and write your Congressman about this travesty. It’s time to stand up and be counted and get our benefit back from those that have taken it from us! Or ignore the problem and kiss your benefit goodbye; nobody else cares! This entry was posted in Closed Network, CMAC Table, Emergency Care Access, International SOS, Tricare Management Activity (TMA), Tricare Overseas Program Philippines. Bookmark the permalink. I’m writing another letter to my Senators and representatives. I don’t know what good it will do, but it can’t hurt to write the letter. I will also copy the VFW and Purple Heart Society. We have experienced negative results from elected officials contacts, from prepared, useless responses to being ignored, however the VA scandle has now included our OPC here, at least to the point that is a veteran’s benefit function, and needs to be investigated along with the rest of the health benefit systems. I think that reaching out to news sources in the past seems to have been the most successful results received. Now with mention of Tricare by some commentators, we need to get the attention of as many of them who may even want to mention our plight here, as they don’t seem to be included in the chain of corruption which ISOS uses to bribe various DOD officials into silence. We must remember that this farce of a “demonstration pogrom” (progroms were a means of persicution, that was not a misspelling) is not designed to stay local, this is a crooked, vile, fraudulent attempt to mount and devert into private pockets, high returns of not only our money but government funds on the backs of retired veterans and their dependants on an INTERNATIONAL (“INTERNATIONAL”, AS IN “INTERNATIONAL S O S”) scale. This is our most opportune chance to get our story out, besides writing an E- Book about it. The names of the principal perpetrators in this fraud both begin with the letter “M”. We can refer to them as M&M, since they present an rxterior shell far different from their interior motives. Yes Toby the information is accurate. It is also possible to file a lawsuit. However we were told it would require millions of dollars to fund the cost as the offenders, the government and contractor, would spend millions up front to keep the case from even going to trial.